Selected Articles: 9/11: Do You Still Believe that Al Qaeda Masterminded the Attacks? Sixteen years ago, Bush officially launched the “Global War on Terrorism”, paving the way for a war without borders. The corporate media backed this illegal act of war which in turn galvanized the public for immediate support. Did Americans unhesitatingly buy the allegations that Al-Qaeda masterminded the WTC attack and that Osama bin Laden was the number one enemy of the Western world? After 16 years of unrelenting debunking of the 9/11 official narratives by genuine progressive activists, do Americans still believe what their government told them? Below is a selection of articles. The day will live in infamy, the attacks planned well in advance. Bin Laden and so-called “crazed Arabs” had nothing to do with destroying the twin towers and striking the Pentagon. Can the similarities between 9/11 and plans drawn up by the US Department of Defense (DoD) and Joint Chiefs of Staff (JCS) in 1962 under the code name “Operation Northwoods” be easily dismissed? Sixteen years later, the propaganda campaign seeks to “infiltrate” the 9/11 Truth movement by bringing in the notorious 28 pages. 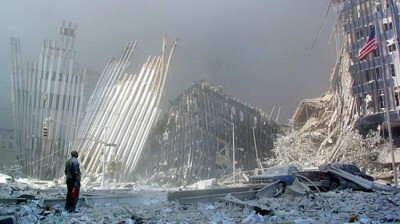 What is now occurring is that Al Qaeda did it, but they were supported by Saudi Arabia (according to the 28 pages), all of which is meant to dispel the fact amply documented that Al Qaeda did not have the ability to bring down the towers and that Al Qaeda has been supported from the outset by the CIA. The towers were brought down through controlled demolition. 9/11 was also a stepping stone towards the relentless repeal of civil liberties, the militarization of law enforcement and the inauguration of “Police State USA”. The 19 young men accused within 72-hours of the attacks were known to enjoy strip bars, alcohol, drugs, and other things that are clearly non-Muslim activities. Moreover, these suspects were not capable of accomplishing most of what was needed to pull off the crimes. Global Research is a small team that believes in the power of information and analysis to bring about far-reaching societal change including a world without war.